The School of Journalism and Mass Communication partners with WLRN public radio to give students real-life reporting lessons. The class is gathered around a conference table in the newsroom shared by the Miami Herald and WLRN public radio. On the screen in front of them is a reporter, John O’Connor, connected via Skype. This class often covers how multimedia platforms are taking over newsrooms, so it makes sense that today’s speaker is streaming live from the Internet. O’Connor is the Tampa-based education reporter for StateImpact Florida, a joint project between local public radio stations and National Public Radio. He’s talking about how all of his stories need to have a statewide angle so they can run on public radio stations across Florida. That’s when FIU student Maria Camila Bernal raises her hand. “Good question,” O’Connor says, recognizing that this is something reporters everywhere are asking themselves in the changing environment of newsrooms. The answer is part of what the students will learn in “Radio Storytelling in a Digital Age.” The undergraduate course represents a first-of-its kind partnership between FIU’s School of Journalism and Mass Communication and a media outlet. Reis called Dan Grech, radio news director at WLRN-Miami Herald News. Reis asked if the station might be willing to help put together a class on radio storytelling. Grech used to teach at FIU and has had several FIU students serve as interns at the station over the years. He says he loved the idea of WLRN employees teaching students, but he also hoped FIU’s journalism students might help the station. WLRN re-launched its Internet site last fall, adding web-only articles and radio scripts rewritten for the web. Grech hoped the students, who had grown up on social media, could help WLRN employees learn how to best tell a story on the web. 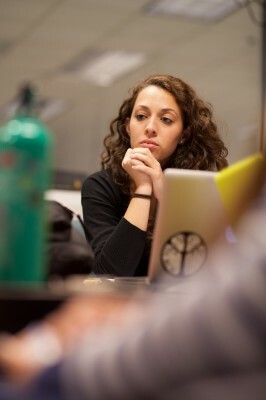 “The students have a lot to teach us about digital platforms, and it becomes something of collaboration,” Grech says. The result of the partnership is a class in which the students learn how to report and produce a radio segment that may air on the station. They also produce a web version of the article and plan how to promote it on social media. 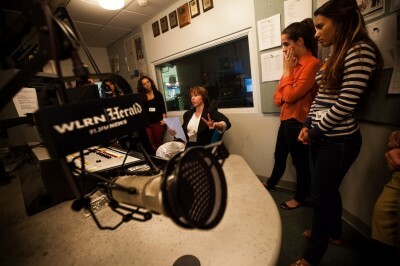 Reis hopes the partnership with WLRN is the first of many for the journalism school. He’d like to see students trained in multiple newsrooms, ready for all facets of the quickly changing industry. The results of the partnership with WLRN were featured at a University of Oregon School of Journalism conference in April titled “What is Radio? Exploring the past, present and future of radio.” Grech and Reis hope their presentation will inspire other universities and media outlets to partner together. The class at WLRN is taught by producer Sammy Mack, who begins by explaining what reporters do every day, how they report to their editors and the ways they pitch their story ideas. The next step is to teach the students how to use radio-quality recording equipment. Finally, the students come up with their own ideas for radio stories and make their case to Mack, who will give the final go-ahead. Barbara Corbellini Duarte says she took the class because she’s trying to decide in which news medium she would like to focus. A 25-year-old native of Brazil, Duarte says that the course has given her the skills to pursue work in radio. For a homework assignment, Duarte reported a story about students who rallied for immigration reform in Tallahassee. She wound up partnering with WLRN’s Tallahassee bureau chief to produce a longer feature that aired as part of the station’s Session 2013 coverage. It’s a lesson Bernal used on the story she had pitched. Her idea was to report on the required college counseling program at Broward County high schools. Similar programs aren’t offered in other counties, and Bernal, a 22-year-old native of Columbia, wanted to find out if it gave Broward students an advantage. This is super awesome, I wished I’d had the chance to learn about this when I was doing my master’s there! This makes me even more excited to start at FIU 😀 I’m majoring in Journalism and I can’t wait to start learning first hand!